We’re a meeting discuss how to run a tiny project. The project was a proof a concept about a new possible service and we had been think to buy a new software tool until the dialog below comes. Joe: We need to prove if this idea is possible to prove is turn a good service. Zee: Sure! I can develop a script to test it. Joe: Then, we have to give a name to this software. Zee: Why? It’s just a script. Joe: C’mon, the awesome services began as a prove of the idea. Zee: Ok, let’s we think about it. Zee: I had a script a long time ago that I called homer. Zee: It was lazy, unfixable and unstoppable. Joe: Wow! Homer Hammer! 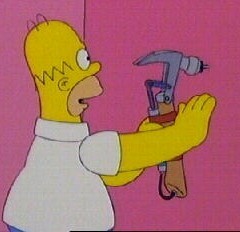 Homer Hammer! Joe: For sure! It’s same idea but with more power devastation.